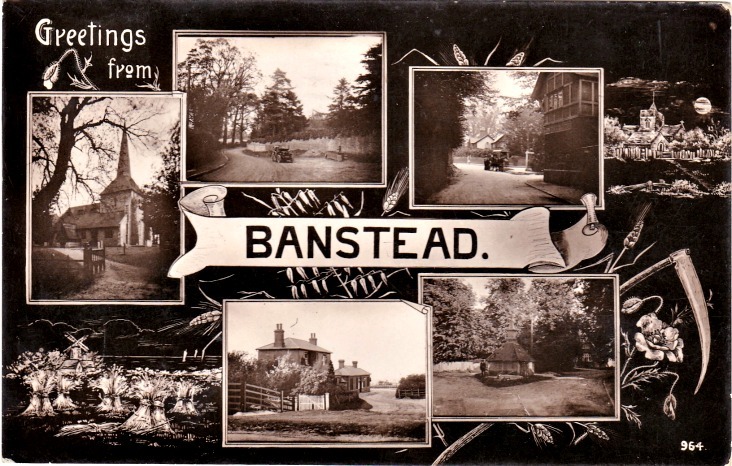 A Real Photo sepia multi-view postcard of Banstead, postmarked 28 July 1916 – complete with stylised etchings of wheat sheaves, windmill and scythes. Views show All Saints Church, Banstead Station and the Well, but I'm not sure about the other two. Top row, far right looks like Parker's Corner, that is Sutton Lane looking towards the High Street and the spot where the War Memorial came to be placed after WW1. Peter, topmost image shows the horse trough outside no. 19 Garratts Lane. The water pump was removed for refurbishment I believe but reinstalled at the left hand end of the trough instead of the middle. It is still there today and can be seen on Google maps quite clearly. Wendy also says that the building that can be seen is the house where Parker's butcher's shop was on the ground floor. The actual slaughter house building was in the back yard of this house, a little bit further into Sutton Lane. On the outside of it nearest the lane were many different posters such as "Dig for Victory". Park Road can be seen off to the left at the top of the picture. At that time, traffic (such as it was) was two-way around the small island, whereas now there is a roundabout close to, but not exactly on the same spot. Wendy and Lewis, thank you very much. I remember the horse trough in Garratts Lane from when I was a boy in the 1950s - I passed it daily on my way from Diceland Road (where I lived) to the Village.